Over a long period of time, there is progression in understanding a subject. Figure drawing has progressed over the centuries(millennia), and it saw a great period of realism and draftsmanship during the renaissance. A great progression of instruction and more importantly instructional material in the form of books happened during the 20th century. Kimon Nicholaides, Brigdman, Hogarth, Loomis, Vilppu to name a few. Each one improving and excelling in a manner that was not available previously. The student of today, has access to the totality of all these developments, and particularly the internet has made it more rapidly possible. 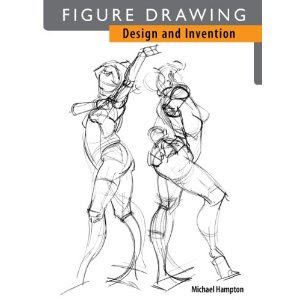 This book is a very refined and concise book, that has in it, some aspect or the other of all the learning and understanding of the art of drawing the figure, as well as all the developments that has happened in the teaching of the subject, in terms of how to approach the learning. You might already have all the best books published on the subject, yet I feel this one is a must add to the bookshelf. - A general approach of Gesture, and how the rhythmic flow of lines capture the essence of the pose. - Next the building up of the form using simple forms such as Boxes, Spheres and Cylinders are dealt with. These basic forms are only an aid in visualizing and positioning the various body parts, since these are gross approximations. - Next the landmarks of the anatomy are presented. Though the study of the human body can be carried out to any possible depth right into the very soul, as artists one need to know and apply just the "right enough" detail to create the believability. Anatomical landmarks provide such key elements , which when properly positioned and presented help create the appearance of a real figure. - After this broad treatment, the anatomy of all the important parts of the body are very clearly dealt with. Basically the Skeletal and Musculature are the primary elements that go into the study of anatomy. One interesting aspect is that each part , say the Deltoid muscle for instance, is analyzed for its Gesture, Shape and Volume. And using a unique color for that muscle, the figure is shown in various poses and angles, clarifying the particular part, and how it changes based on what the figure is doing. For instance, the rectus abdominis does a lot of twist and turning as the figure goes about doing various actions. these variations help visualize and understand the muscle group better, enabling one to apply accordingly and create a convincingly real figure. As Vilppu would say, all these basic tools such as spheres, boxes etc, are only gross tools, in reality none of the body parts are like these. For instance the Pelvis gets approximated to a box, or a bowl or a series of discs, but in reality the pelvis is nothing like any of these. The only way to draw a pelvis perfectly is to know the pelvis perfectly. But once that is known, these tools can help in visualizing and constructing. and help apply perspective, proportions etc. One certainly will get best results by taking a regular art school class, or if not, by going through video lectures. and this book would make a great companion to it. Text Book: Vilppu Drawing Manual. Reference: The Figure Walt Reed, Burne Hogarth books, Brigdman, Andrew Loomis, Will Eisner Expressive Anatomy etc. As one moves along one should get a bit of Perspective, Composition, Story Telling etc.. and more towards the discipline of specialization. This book under review fits in so perfectly as the text book for learning constructive anatomy, with all the details needed for learning as well as for reference.